monitoring software for all occasions. Simultaneous monitoring of several storage devices. 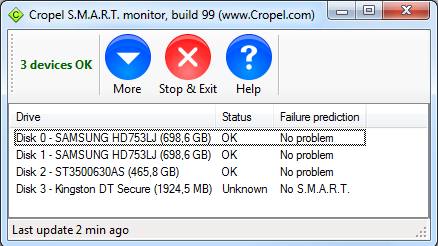 Monitor hard drive health and predict a device failure based on the S.M.A.R.T. data collected. Warn that the value of an attribute exceeds its threshold by displaying a message. Read and display raw and normalized values of S.M.A.R.T. attributes for various data storage devices. Display a history of normalized values for a S.M.A.R.T. attribute. Give a frequency of values of some S.M.A.R.T. attributes either for a particular storage device or for all the devices of the same model and revision, depending on the attribute. S.M.A.R.T. stands for Self Monitoring Analysis, and Reporting Technology. It is a standard method used by regular hard drives (HDD) and solid state drives (SSD) to measure certain internal diagnostic parameters and report these parameters to the PC. The full list of known attributes is available here. On the PC, Cropel Hard Drive Diagnostic software monitors hard drive health by reading, analyzing, and classifying these diagnostic reports, referring to centralized database to compare your drive with other drives of the same make and model. The reports are then filed in three categories: no problem, probable future failure, and imminent hard drive failure. The predictions become more accurate the longer you use Cropel.